Wat is dit voor site? Wij zoeken de goedkoopste boeken op internet. 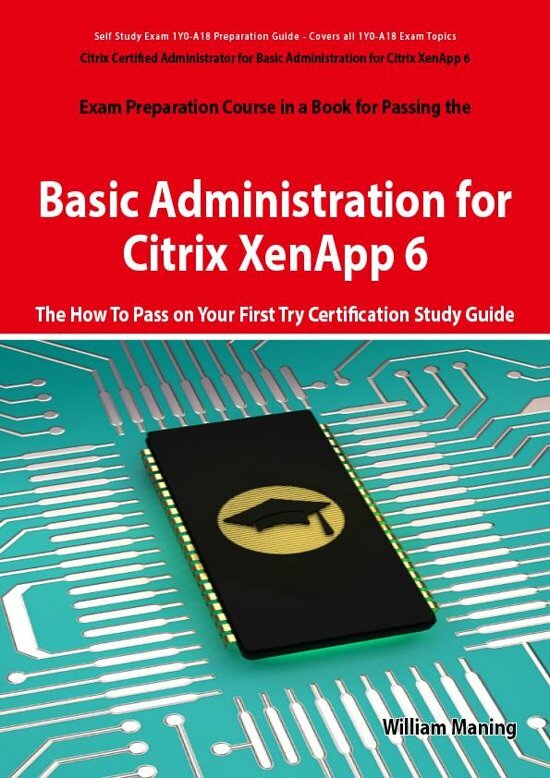 Basic Administration for Citrix XenApp 6 Certification Exam Preparation Course in a Book for Passing the 1Y0-A18 Exam - The How To Pass on Your First Try Certification Study Guidevonden we het goedkoopst op Bol.com voor €22.99. We hebben gezocht in nieuwe en tweedehands boeken. Rechtsonderaan de pagina kan je het boek direct bestellen	via Bol	.com. The Basic Administration for Citrix XenApp 6 training course provides the foundation necessary for administrators to effectively centralize and manage applications in the datacenter and instantly deliver them as a service to users anywhere. This self-study exam preparation guide for the Basic Administration for Citrix XenApp 6 certification exam contains everything you need to test yourself and pass the Exam. All Exam topics are covered and insider secrets, complete explanations of all Basic Administration for Citrix XenApp 6 subjects, test tricks and tips, numerous highly realistic sample questions, and exercises designed to strengthen understanding of Basic Administration for Citrix XenApp 6 concepts and prepare you for exam success on the first attempt are provided. Put your knowledge and experience to the test. Achieve Basic Administration for Citrix XenApp 6 certification and accelerate your career. Can you imagine valuing a book so much that you send the author a ''Thank You'' letter? This book includes new exercises and sample questions never before in print. Offering numerous sample questions, critical time-saving tips plus information available nowhere else, this book will help you pass the Basic Administration for Citrix XenApp 6 exam on your FIRST try. Up to speed with the theory? Buy this. Read it. And Pass the Basic Administration for Citrix XenApp 6 Exam.